Case Studies | The New Dyna-Purge® D2 reduced machine downtime by more than 50%. The New Dyna-Purge® D2 reduced machine downtime by more than 50%. Molex Corporation is a leading supplier of interconnect products, from electronic, electrical and fiber optic interconnects to switches, plugs and cordsets. 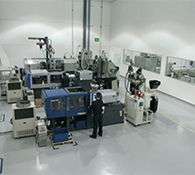 The company’s facility in Juarez, Mexico produces a number of electrical products utilizing Sumitomo Electric Molding presses with screw size ranging from 18mm to 50mm, and operating at barrel temperatures of 550° F. Molex had been using Dyna-Purge® M purging compound with great success when their representative asked them to sample the New Dyna-Purge® D2. Hugo Beltran, Senior Molding Engineer at Molex, said the company purges the machines on a daily basis, at every mold changeover, color change, and over the weekends. They run a variety of resins such as Nylon, ABS, PC, PP, PVC, PBT and PET. “We were using Dyna-Purge® M for shutdown and start up, and it helped us reduce purging time by 15% and increase machine productivity about 30%,” Hugo Beltran explained. “When we ran the sample of the New Dyna-Purge® D2 we experienced even better performance — it reduced machine downtime by more than 50%.” Molex is a low volume, high mix facility, resulting in a number of difficult purging challenges. These include color changes such as transitioning from black PVC to clear PC. 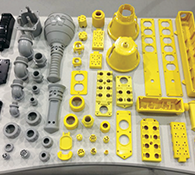 Also, changing from high temperature to low temperature materials — and vice versa — can cause problems such as blocked nozzle tips. The New Dyna-Purge® D2 will allow Molex to start producing quality parts faster and avoid wasting production material on contaminated parts. Machine downtime reduced by more than 50%. Savings on raw materials due to less purging compound needed. Less scrap from contaminated parts. Using Dyna-Purge® D2 helps Molex create high quality parts in less time and with less scrap. Molex tested Dyna-Purge® D2 in their state-of-the-art equipment and it reduced machine downtime by more than 50% as a result.